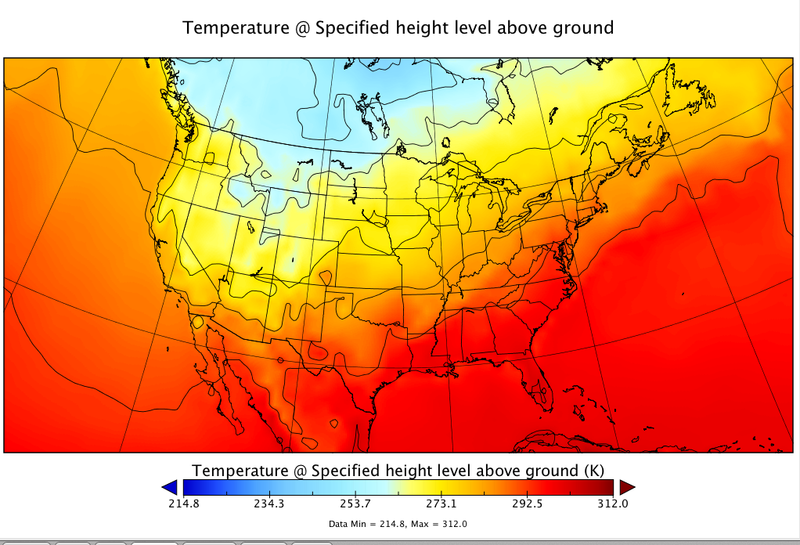 I plotted up the temperature analysis to show how Boston--and pretty much the entire northeastern US--enjoyed a warmer Christmas in 2015 than Los Angeles. Bad Dad pointed out that this is a junk graphic because everyone already knows this. 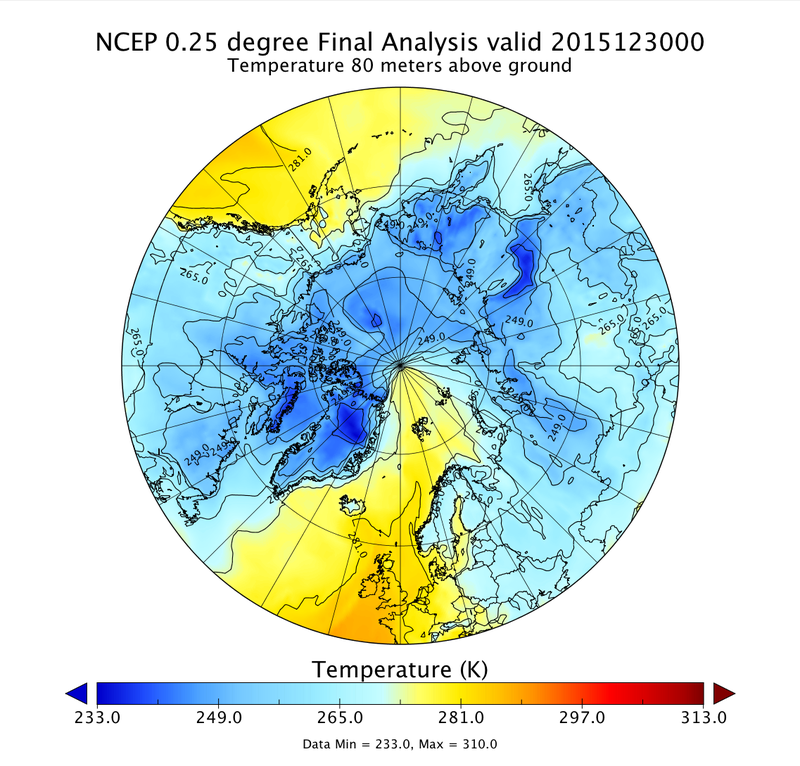 But, plot it up in polar stereographic, and it gets more interesting. 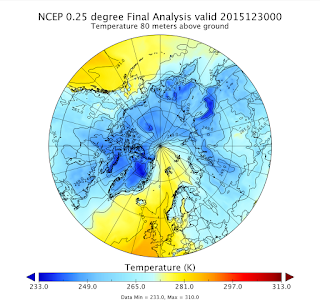 In fact, when I plotted up today's near surface temperature analysis in polar stereographic, you can see that the north pole almost got above freezing! Moreover, it exhibits a wavenumber of 2. 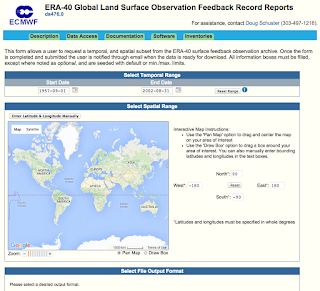 AER's Arctic Oscillation Analysis and Forecasts page gives a technical explanation of this event. 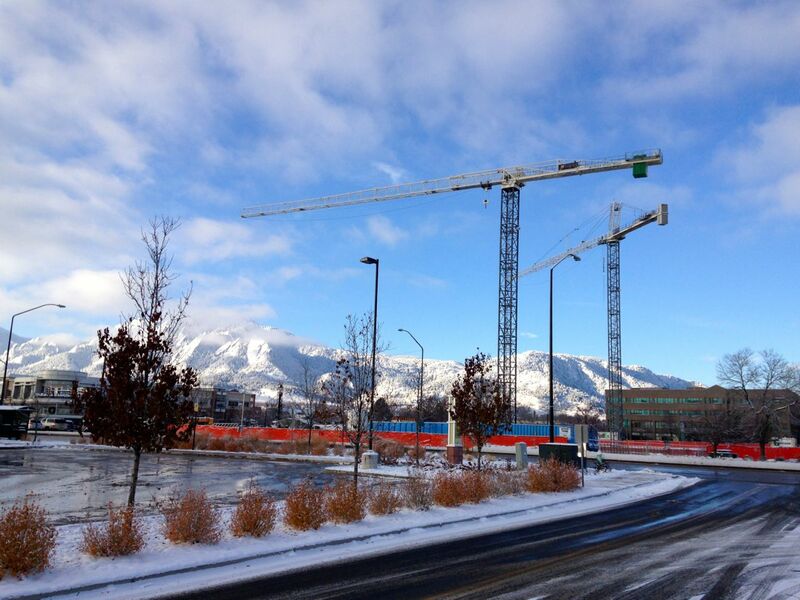 November through December is a busy time of year for professional and personal reasons. AGU's Fall Meeting is a professional highlight and capstone to each year, but preparing for it is stressful. I don't know why I thought it was a good idea to present my work to both the Geoinformatics and Education communities in different sessions. With nearly 24,000 attendees, AGU Fall Meeting is the largest Earth and space science meeting in the world. With 24,000 attendees, it's necessary to get over FOMO (fear of missing out). There is too much going on and you will always hear about some great talk or poster session after it has happened. The large number of attendees meant that it was a great time to hold multi-agency meetings and get sh*t done. I had some fruitful discussions with colleagues from NOAA, NASA and the Air Force lab I used to work at. This resulted in some much-needed ego-stroking ("I really like/respect what you are doing.") and even more work ("But could you also do this/that?"). This Spring, I will be giving an internal WIP (work in progress) talk, teaching "Data thinking before data crunching" at a Big Data workshop for graduate students, and helping to design/write a "Best practices for data stewardship" framework/document for data professionals. This is in addition to my normal job duties. After AGU, Bad Dad and DD usually drive from LA to SF for a weekend in SF and a few days with my mom. This year, we had the added excitement of a hit and run driver hitting our Prius just after Bad Dad dropped DD and their luggage off at the hotel in downtown SF. Fortunately, no one was hurt besides our car (damage 80% of resale value of our car). Through the help of insurance and the amount we received for selling the car for scrap, we have a 2016 Prius V (station wagon). Yes, we bought a car while we were on vacation so we could drive home. My mom needed/wanted a new computer and phone. So we added helping her purchase and set up a MB Air and iPhone to our to do list. I'm so impressed with how quickly she was comfortable with the iPhone. She said it was familiar because she took an iPad class when she bought one years ago and read the iPad for Seniors book the teacher recommended. I'm going to look for a similar book for the iPhone and Mac OS X. This is a long explanation for why I haven't sent out year end/xmas cards yet. If I send something out between the Jewish and Lunar New Year, our holiday cards are on time. A friend mentioned experiencing a 64 F Christmas day in Boston. 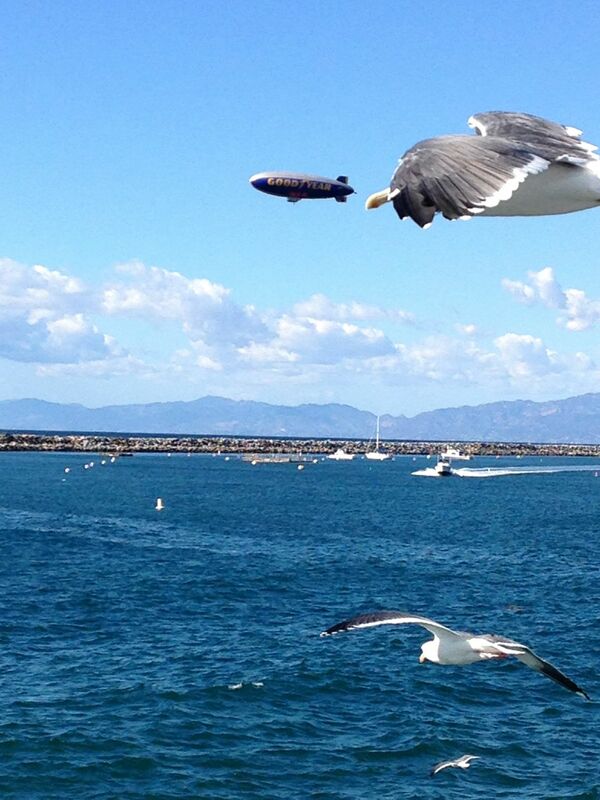 It may have been balmy in the northeast, but Los Angeles had a white Christmas. Proof. 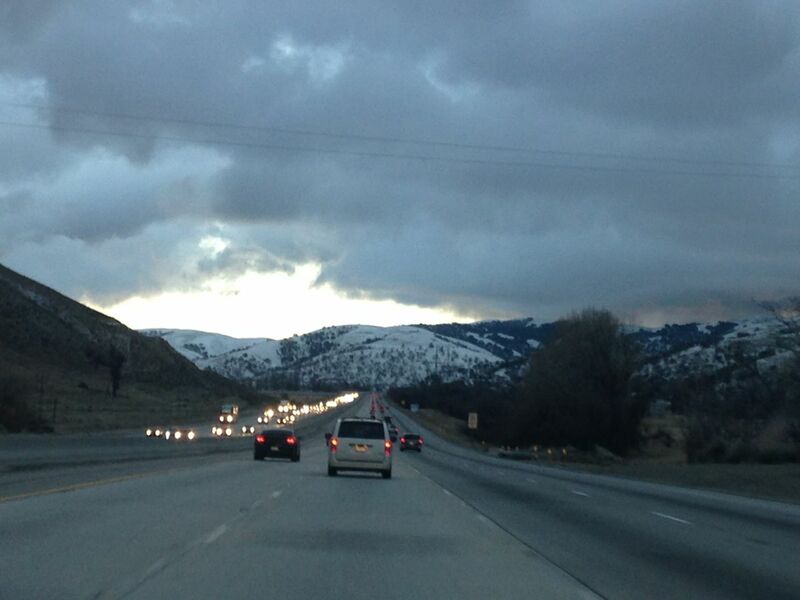 Snow seen on the southbound "Grapevine" section of I-5 between the central valley and Los Angeles. 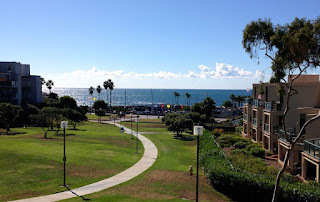 A few times in the last 20 years, we have woken up in our Redondo Beach home to see the snow-capped San Gabriel mountains from our north-facing windows. We drove home after the rain/snow. But there was enough snow on "the Grapevine", the pass between the central valley and Santa Clarita valley (in LA county) to suggest we missed that pretty sight. 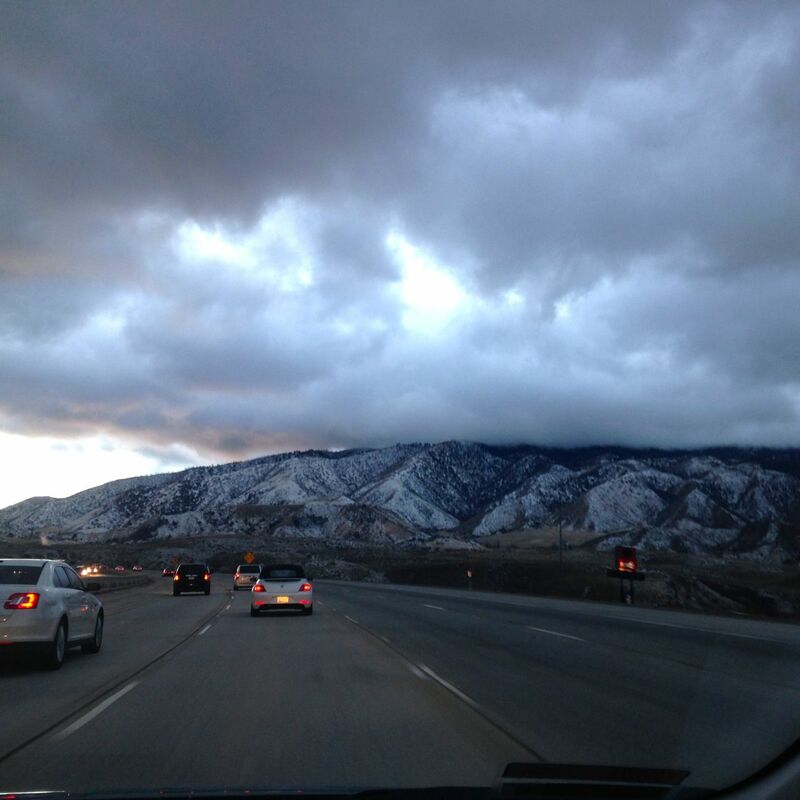 We saw plenty of snow on the north-facing slopes, even inside the Los Angeles county line. The view right after passing the "County of Los Angeles" sign. A colleague who studies waves said that mid-latitude quasi-stationary waves have a wave length that often result in anti-correlation between the east and west coasts of the US. That is, when one coast is hot, the other is cold, and vice versa. 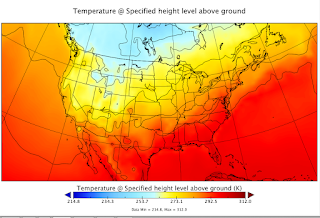 The hot/cold anomalies will see-saw between the coasts. With climate change due to a melting arctic ice cap, this kind of behavior is expected to be more stationary. That is, the waves will see-saw less often and set up semi-permanently a la "the ridiculously resilient ridge". Scary food for thought. Colorado Gives Day broke yet another contribution record with 123,999 donations made during the 24-hour event, bringing in $28.4 million. 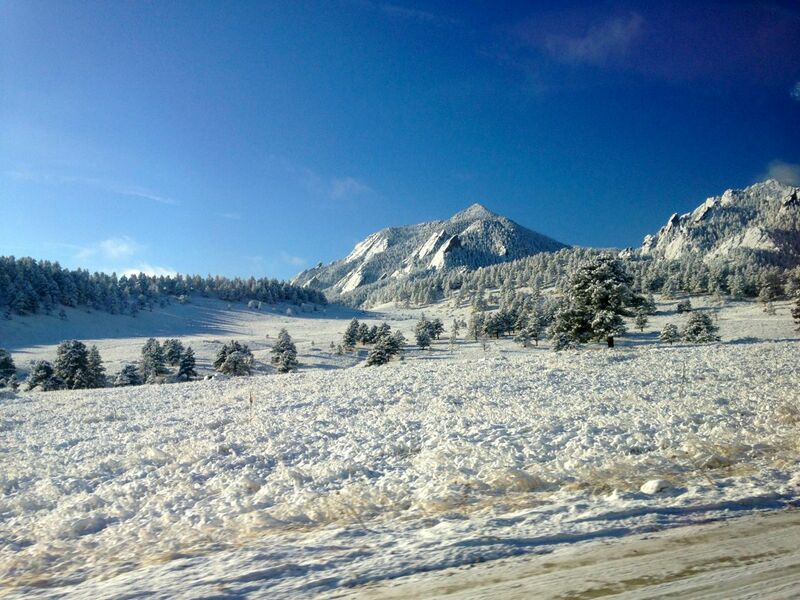 Colorado has over 5 million people, so that comes to less than $6 raised per person. How much social services does that buy? Consider how many people now work in fundraising jobs compared to 40 years ago, when the tax rates were higher. Is professional flattery the best use of our society's labor? Now compare the Colorado State Tax Revenues for 2013 (the most recent year I could find on line). The state spends ~1% of gross collections on administration. In the world of philanthropy, anything less than 10% administrative & fundraising costs is considered excellent. 20-28% is more typical. We are getting more than an order of magnitude of better value in our administration costs through taxation rather than volunteer philanthropy. Just as I back evidence-based medicine, I back evidence-based governance. I would like to publicly state that I find the whole idea of philanthropy distasteful for the reasons explained here. Colorado's tax system is a regressive disgrace. I don't need this study to tell me. 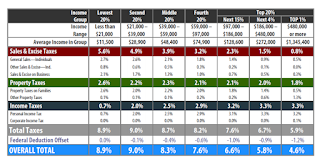 I felt the economic pain when I was a graduate student teaching three different 'preps' for $800/month and having to pay a higher tax rate than people earning much, much more. That is not a typo. 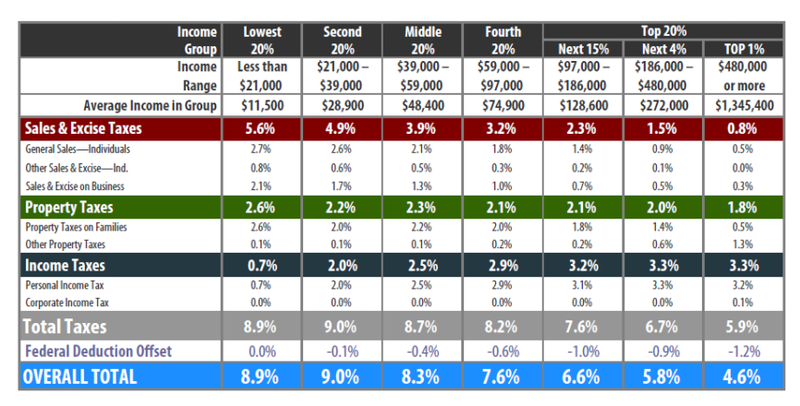 The poorest 20%of Coloradans pay double the effective tax rate of the richest 1%. Should you wish to participate in tomorrow's Colorado Gives Day, may I suggest High Country News? I like to donate HCN to high school libraries or science teachers because they do high-quality, in-depth journalism about issues that no one else covers. Citizens need to get exposure to these topics as early in life as possible. They will see things in a clearer light for the rest of their lives. 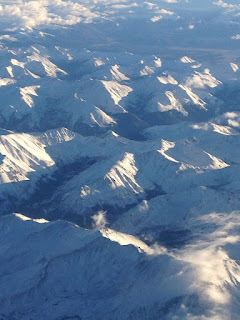 Yes, very few people actually live in the high country. 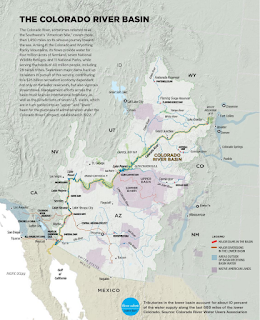 But, this picture of the Colorado River Basin shows why people need to pay attention to the shenanigans in the small towns of the headwaters. I'll come back to this picture later, when I have more time. 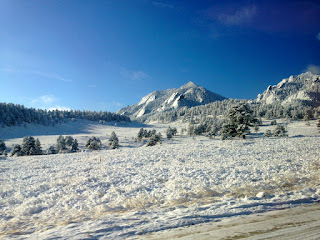 This one is for Rose in SV, who misses the snow. Waiting for the shuttle to the office. It takes a little bit longer to take the shuttle than to drive, but it is so much more relaxing, especially when the streets are icy. See the difference artful cropping makes? They say that Colorado has two seasons: snow season and construction season. 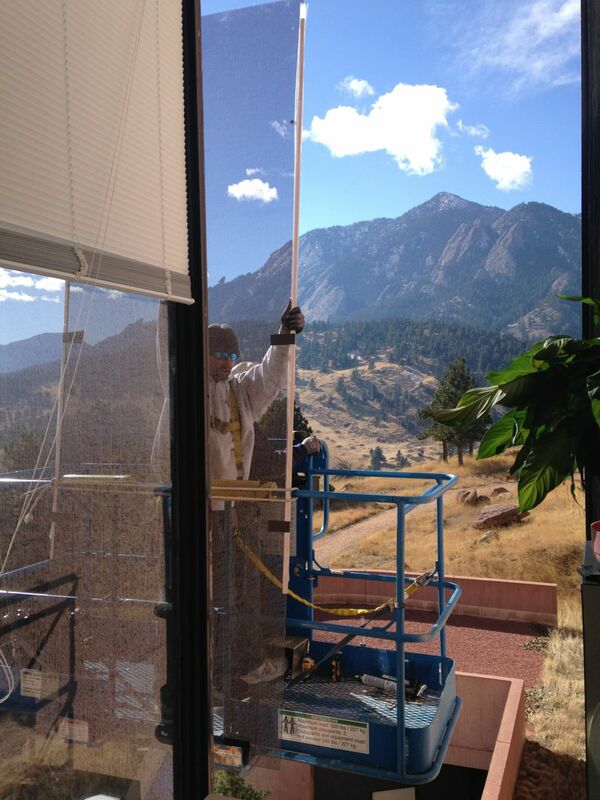 In central Boulder, construction never stops. 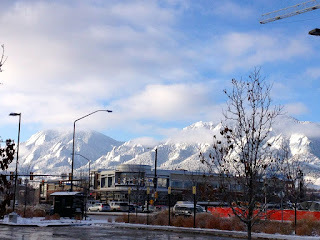 My office window faces S. My condo windows face W, N and E. So I enjoy a 360 degree view if you sum over my entire day. 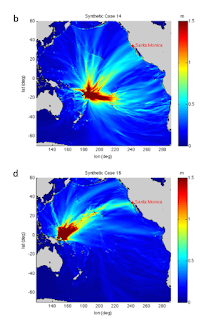 PS, I am in SF December 13-19, 2015 for the 2015 American Geophysical Union Fall Meeting. Anyone want to get together for food/shopping/culture on Sunday, Dec 13 or a weeknight evening? I'm staying downtown but can meet anywhere I can get by public transit. Colorado Public Radio ran a lovely story this morning about Linda Ligon of Thrums Books*. 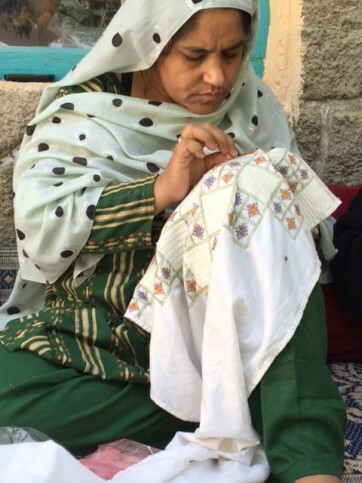 Linda travels around the world to learn about 'endangered' forms of traditional needlework and the women who make them. Listen to the story and view a slide show of some of the places she's been. Afghani woman doing traditional embroidery. She's right in her observation that most of her interviewees want a 'better' life for their children that does not involve making needlework. These art forms will die out unless we provide a market where people can make a good living doing this. 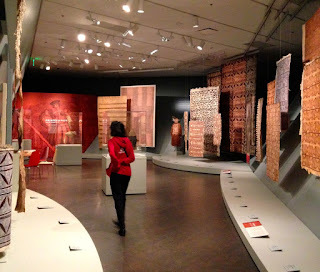 I first became aware of Afghan embroidery when I saw the Common Places show of Afghan embroidery at LACMA. 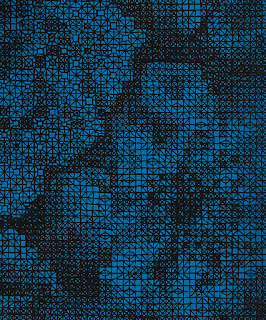 The Italian artist Alighiero Boetti employed a similar tactic to the researchers at the Fowler. Although, being a man, he used female intermediaries to meet the needlewomen that collaborated with him on the art work. UCLA's Fowler museum has one of the world's largest collection of handmade textiles because their anthropological researchers would pose as collectors of textile art (which are usually made by women). Researchers would say that they will buy only if they are sure about the provenance; they must speak personally to the artist. In many societies, women are not allowed to speak to outsiders. But, with $$$$ riding on it, the researchers were able to purchase access to interview subjects. Along the way, they collected some mighty fine textile art. See it on display on the UCLA campus! * What? You don't know what a thrum is? Have you been living under a rock? 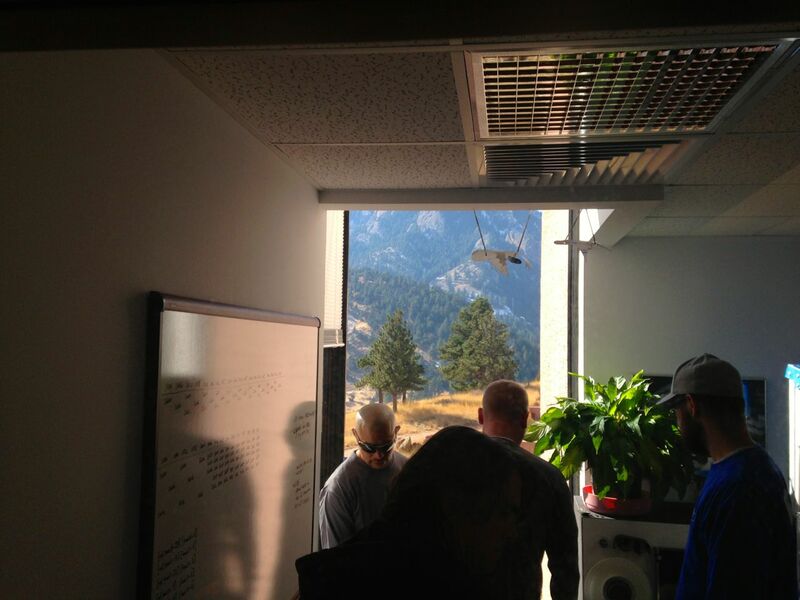 A couple of weeks ago, we had some wild winds up at the Mesa Lab. The instruments up on the roof of the building recorded a peak gust of 94 mph! Notice how the sustained winds (in red) were pretty similar for the last 3 events while the peak winds (in blue) varied much more widely? The frequent high winds rattle and stress the windows. The larger ones are prone to cracking and breaking. My neighbor noticed the crack in his office window before the wind incident of November 18, 2015. It isn't every day that you can see a paneless opening in your office building. It took three guys on the inside and one guy on the outside to replace the window. People in Boulder ask what I like to do when I am in LA. Bad Dad is a good cook and LA boasts some fantastic low-cost restaurants. 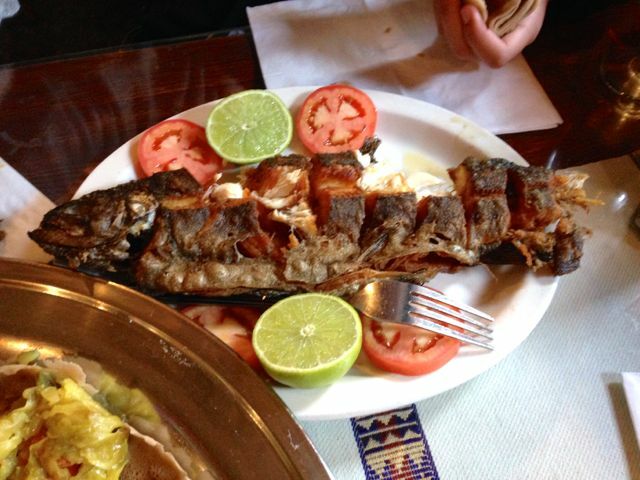 You can take a culinary world tour without traveling far. Rosalind's Ethiopian Cuisine (Ethiopia and Nigeria) on Fairfax. Vegetarian sampler, fish tibs, yedoro wot. Rice Things (Japan) in north Redondo Beach. Tempura udon/soba. Lee's Tofu (Korea) in Gardena. Everything there comes with a bottomless kimchee bar. I eat a tofu/seafood hot pot, but my carnivore DD likes the Korean BBQ ribs. We split the combo. Dumpling House (Taiwan) in Gardena. Small plates. Taiwanese street food in a casual setting. Lee's Tofu and Dumpling House are just two of the dozen restaurants in bustling pan-Asian Tozai Plaza. We haven't had a bad meal in that strip mall yet, but we haven't tried the Marie Calendar's. Bubbling seafood tofu combo with beef ribs and bottomless kim chee at Lee's Tofu in Gardena, CA. When you finish your kim chee and other sides, just ask for more. And this is why I lose weight in Boulder, but regain it all in LA. Did you know that, when you buy a home or a plot of land, you don't automatically buy the mineral rights under that plot? Moreover, the seller of a property does NOT have to notify the buyer that the sale does not include the mineral rights. The loophole that does not require disclosure probably stems from the wild gold rush days when mineral claims records were patchy and often lost. Sometimes, the owner of the property is genuinely ignorant about the status of the mineral rights of the property they are selling. However, this loophole is being actively exploited by some of the largest home builders in the US. For instance, Mother Jones explains how D. R. Horton systematically strips and sells the mineral rights from parcels before they build homes. They used to disclose, before public awareness of fracking. But, they stopped disclosing once buyers started asking questions and balking. For tens of thousands new home buyers, their first indication that mineral rights have been stripped from their property is when a truck carrying a rig rolls into their neighborhood as in the photo below. 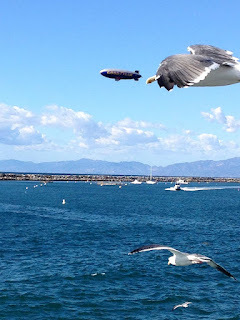 All photos and maps courtesy of Fractivist and used with permission. For most homeowners, this is the first indication they receive that they don't own the mineral rights under their home. 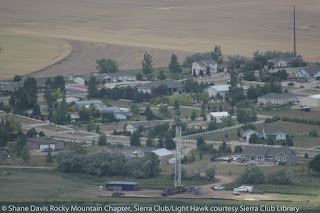 New home development in Colorado with oil and gas wells drilled AFTER the homes were sold. If you were a homebuyer, wouldn't you like a quick and low-cost way to find out who owns the mineral rights under the home and what kind of mining they might do in the future? This is an extremely tedious process that requires specialist training and often involves travel to look at old records in many different possible records sites. This is why Benchmarking Government matters and why I think the media and many government watchers are focusing on the wrong thing. More people, not just Governor Brown, should perform the data retrieval experiment and request the Division of Oil, Gas and Geothermal Resources to provide information pertaining to their land. Some of the fastest-developing areas in the country--North Carolina, Colorado, inland California--are the areas with the most potential for mining and oil and gas drilling. Those home buyers deserve to know before they buy. In fact, people who think they own mineral claims should have a deadline to prove and register their claims to a publicly-accessible digital database or lose their mineral claims. The public should be able to search this database without charge. What do people do in the absence of reliable information? They rely on their government to protect them against deep-pocketed oil companies. 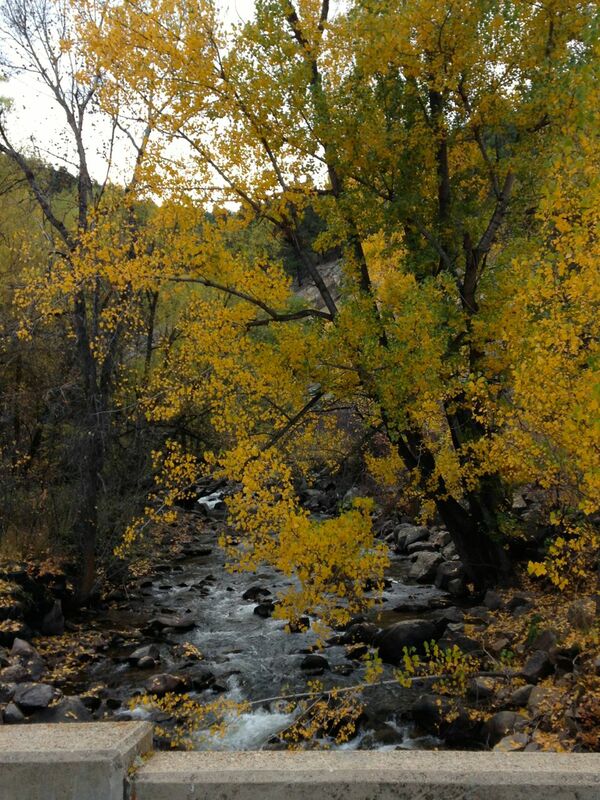 Notice the line between Weld and Boulder counties and where the wells lie? 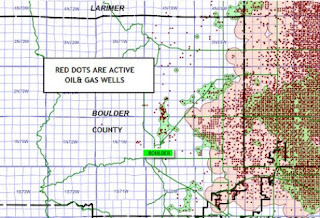 Politics, not oil, often determine the location of active oil and gas wells. 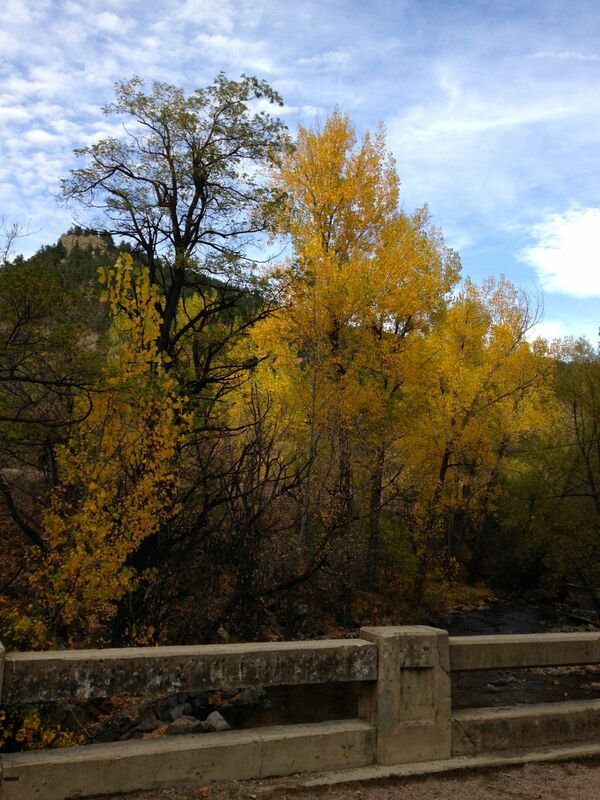 In Boulder County, registered voters skew 41.6% D to 18.8% R versus 38.4% R to 23.2% D in Weld County. 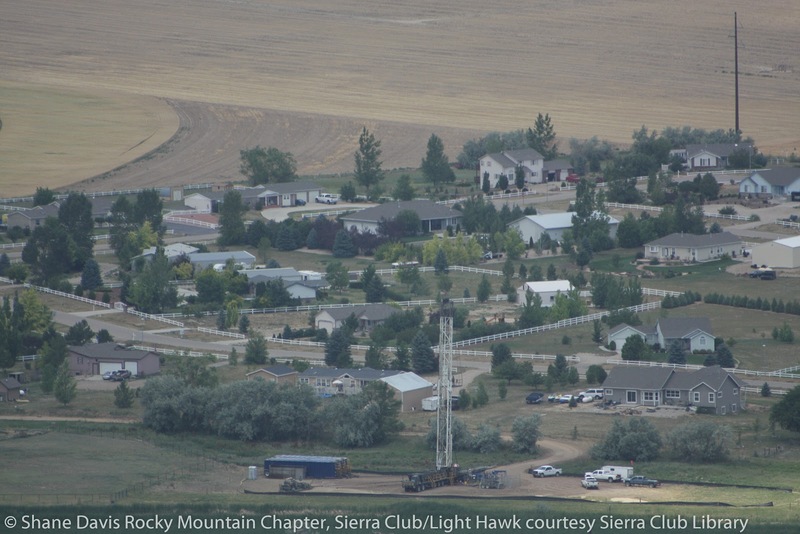 Guess which county banned fracking and which county government welcomes it (despite homeowner protests)? 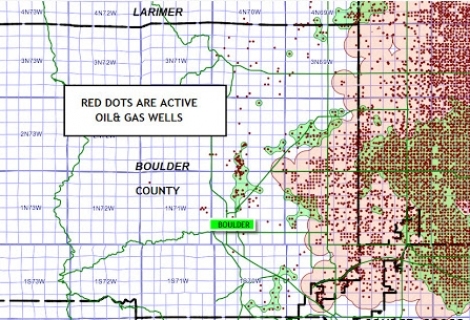 Politics, not oil, often determine the location of active oil and gas wells. Yes, I do think it is odd that the political party that purportedly stands for personal choice doesn't want homeowners to choose not to allow fracking under their homes. This issue contributes to the 'big sorting' of America. It's divisive and contributes to longer commutes (and more burning of fossil fuels). This is why I believe it is so important for government to be able to provide complete and accurate records. I'm willing to pay the taxes to develop and sustain these services because I want the records to be available everywhere--and not just in the places where private companies think they can make money doing so. Also, I want uniform categorization rules and true data interoperability, something that is difficult to enforce in the dot com sector. Because of my work, I've been able to observe that government has a good track record on data interoperability. In the for-profit sector, companies have financial incentive to 'hoard' their data and to make it difficult for others to use. I'm still processing the terrorist killings around the world right now. I'll leave discussions about that to people who understand it better than I do. Right now, I want to shed light on a little corner of the universe that I do know better than most. Hopefully, the amount of understanding in the world will go up a little bit because of what I write. I am a data specialist in a geophysical data archive so I follow news about geo-referenced data more than the average citizen. Actually, I'm a bit obsessed with how data searches work or don't work and why. This editorial appeared in my customized news feed and I was completely flummoxed by the ignorance displayed by the editorial board of a purportedly top-tier newspaper. It's inappropriate for the governor to call the head of an agency for help with personal business, especially someone he had just installed in the job nine days before. It also was wrong for his aides to follow up with the agency to ensure that there would be a map and other specific information. State employees are paid to do state business, not take care of the governor's personal matters. Brown received his report within a couple of days after he asked for it — an uncommon alacrity in state government — and also received a satellite map drawn up especially for him. When I read that, I was shocked, but not for the reason the editorial suggested. I was impressed that Governor Brown, a 77 year-old philosophy major, understood the scientific method and how to apply it to data problems. Whenever you tinker with a system, you run benchmark tests before and after. If you install a new chief of a department, you measure his effectiveness by testing response time and job quality for a common task required by the department. Moreover, you run this test for a case that you know well, so you can assess the accuracy of the results. Asking for all the info on oil and gas extraction in the past, and potential for the future, for the family farm is a great idea. His family has owned that land for more than 150 years. If there had been oil and gas exploration on the land in the past, he would have known about it. I asked my husband, a field scientist, what he thought of the story. He said that you always test in an area you know really well, so you can gauge the quality of your measurements, before you go to an unknown area. So that's two scientists who were impressed with the governor's grasp of the scientific method. The governor got the correct answer in 24 hours, according to this later story with more details. The wire service story said that "after a phone call from the governor and follow-up requests from his aides," the regulatory agency "produced a 51-page historical report and geological assessment, plus a personalized satellite-imaged geological and oil and gas-drilling map" of the area. You know, just like any ordinary citizen would expect to receive. But the characterization of the service appears to be a stretch. Except for a one-page personal memo, all the material collected for the governor amounted to merely a pile of old letters sent other property owners, historic data from yesteryear and some oil field maps. 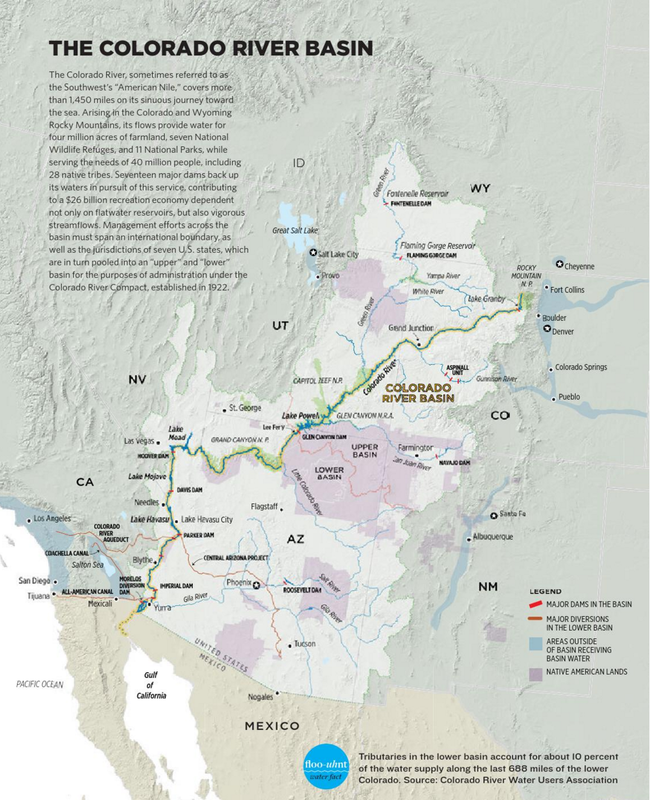 "Everything is available on the [state] website," said Nancy Vogel, chief spokeswoman for the Natural Resources Agency, the umbrella entity for these regulators. "If you know how to find it. "They did not do a formal assessment. That would have been many weeks of work." The governor got back his answer within 24 hours. "The potential for significant oil or gas in this area is very low," the memo read. As for mining, that potential also "is exceptionally low." Steve Bohlen, Brown's appointee as chief regulator, said the governor asked him about the geology of the land, past oil or gas production and potential for any future production. "I said that was easy to do," Bohlen told me. "It wasn't like 'drop everything.'" Two petroleum experts who aren't necessarily Brown fans confirmed to me that all this stuff is available on the state's oil and gas website. That "just like any ordinary citizen would expect to receive," is a low blow. Ordinary citizens in this data-driven era should be able to look up the mineral history of their land (or surrounding land) as that is the best predictor of future mineral development. The Center for Public Integrity gave California a C- in their 2015 State Integrity report card. The grade was largely brought down because of an F on Public Access to Information. Making public information easily available to citizens should be a high priority and the governor should appoint public officials who are committed to improving data processes and data access for citizens. Running a benchmark test at the start of a new department chief's tenure was the right thing to do. Let's hope that this media 'gotcha' campaign doesn't deter him from running the 'after' benchmark test to see if they turn up more (or less) data faster (or slower) after Bohlen has been on the job for a while. 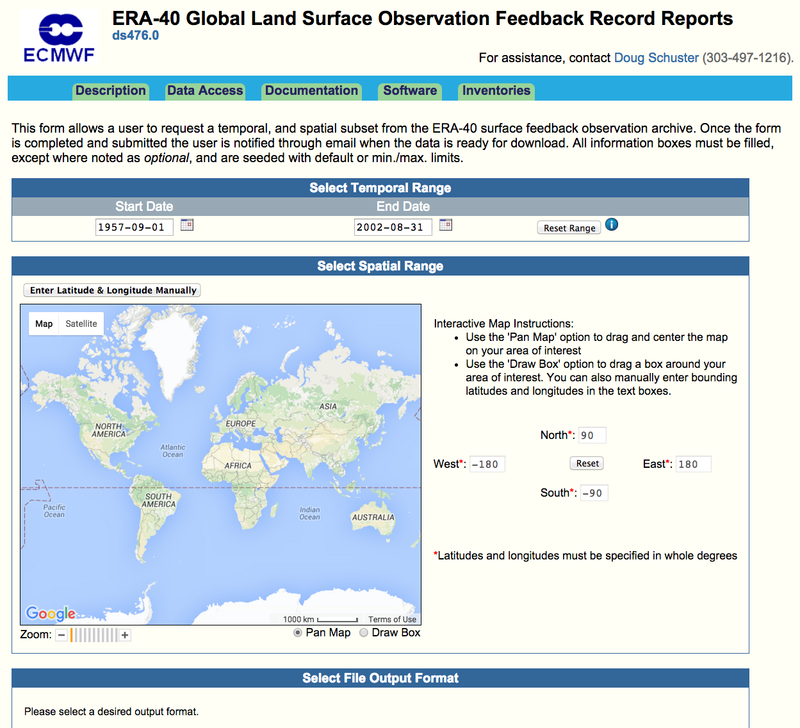 Geophysical data is extremely difficult to search for many reasons. 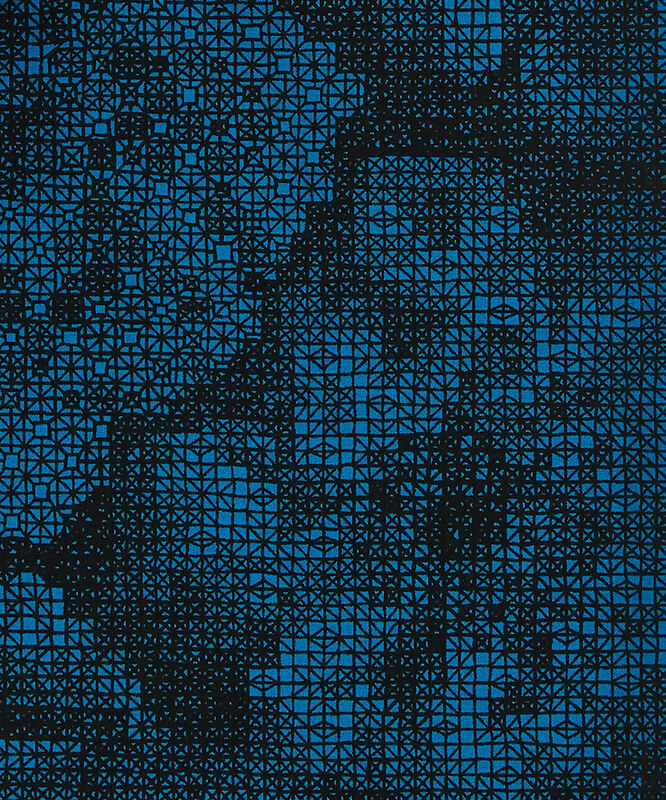 Records are messy, inconsistent, and often came from the pre-digital era. So many things can get lost in the translation--or get plain lost. We are so accustomed to nearly instantaneous searches on the internet, we forgot how much work goes into making this magic mundane. For instance, do you know how much software and data engineering went into creating this data order form? Do you know the international treaties that enable the sharing of this data? The small army of people who worked to clean up and standardize this global dataset? It took a whole lot of work to make this look easy. But it was anything but easy or simple. I explain why this issue is important in Benchmarking fracking. I took this photo two weeks ago, flying westbound between DEN and LAX. 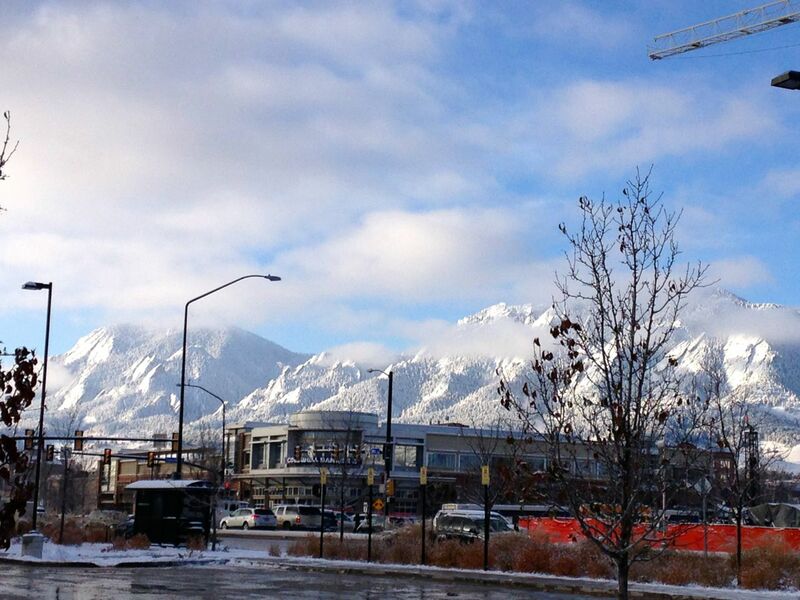 The snowpack has deepened due to our recent snowstorms. I believe we were slightly west of the Continental Divide, so this snow will eventually make it into the Colorado River and some of it will wind up in LAX. The snow blew sideways outside my window for much of the afternoon. When I left work tonight, I worried that I would be blown off the mesa! I really didn't want to draft a pattern for the helmet-like Harley Quinn hat. 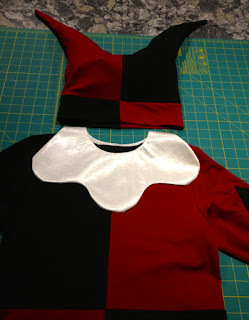 Fortunately, I found Alchymyst's tutorial for a simpler jester hat in Harley Quinn colors. Behold, my simplified Harley Quinn hat. I deviated from her pattern by using longer, curved hat legs. But I copied her method of sewing a hat-sized pair of leggings, cutting off the body, and then rotating it 180 degrees for a contrast band. Very simple and effective. We stuffed the legs with crumpled up plastic produce bags to plump them out. The hat will come in useful for those crisp mornings that are a little bit too cool to go hatless, but too warm for her fleece hat or her hooded winter parka. I was resigned to purchasing white satin at a big box store and making an one-use collar. But, I scored 4 yards of white poly satin for 99 cents at the ARES thrift store. I laid the front and back pieces of Kwik Sew 2555 (the pattern for the top) together and traced the shoulder line and around the neckline. I used a saucer to draw round shapes--3 in the front, 2 in the back. I checked the pattern piece against the top to for scale. I wanted to use something with more grip than satin for the bottom side. I found a scrap of white cotton jersey. I stitched the shape all the way around with a 1/4 inch seam allowance and then trimmed close to stitching. This is a technique often used in machine applique. This left me a dilemma. 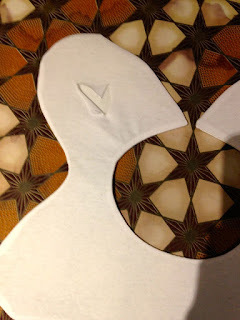 In machine applique, we snip the underside lining to turn the piece right side out. The open cut side is then applied against the backing so that it never shows (or frays). 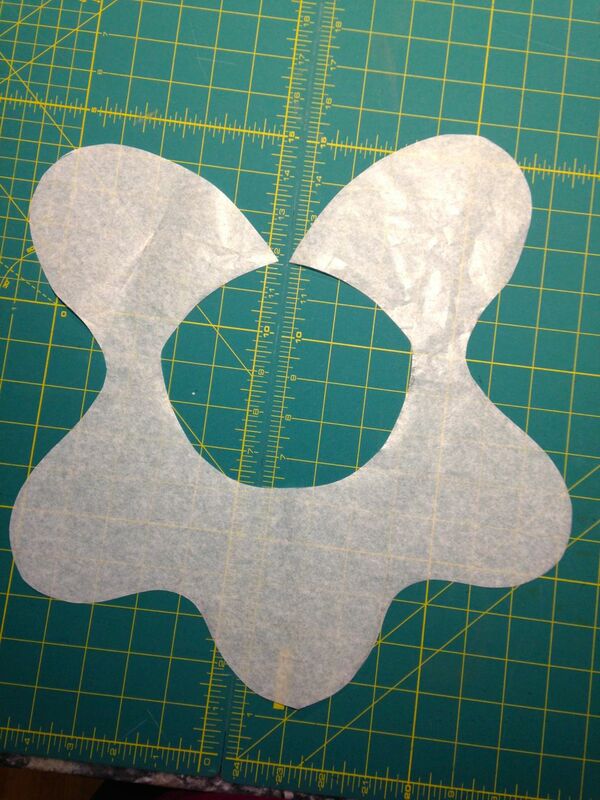 How do I close the cut opening on the collar so that it doesn't fray, stretch or tear? I eventually used a carefully-placed piece of fusible interfacing under the hole and tweezers to hold it in place while I ironed it in place. I sewed snaps on the back collar edge and then called it done. This is the only part of the costume that won't have a post-Halloween afterlife. It's pretty small and made from scraps. I won't lose any sleep over the waste. 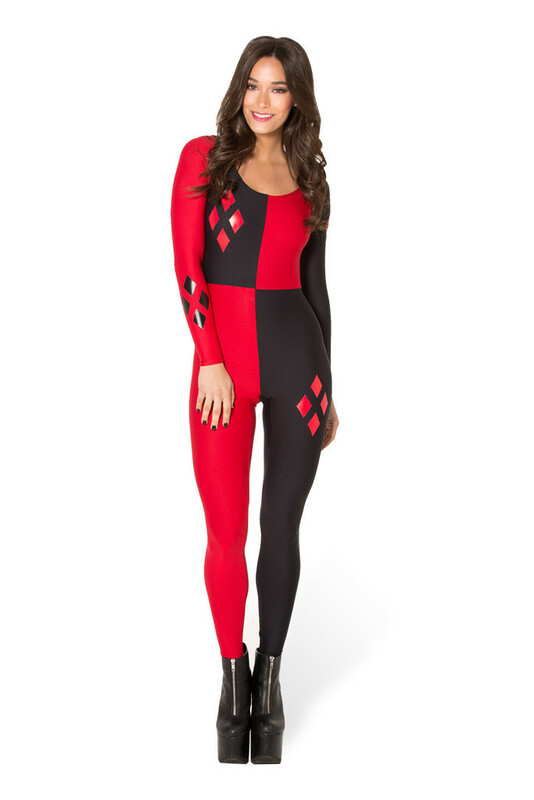 I puzzled about how to get the Harley Quinn one-piece look with two pieces. The bodice reverses the legging colors, but the color change needs to occur higher than the top's hem. 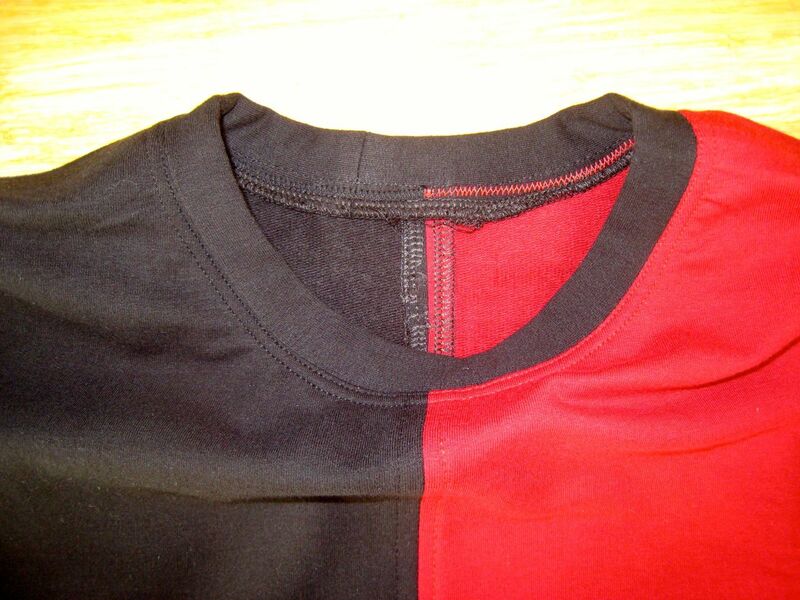 Some online costumes reversed the colors in two places: below the bust (empire) and again at the hem of the top. I wanted one sweep of color from the empire line to the bottom of the legging. I switched thread colors to ensure that contrast stitching (on the outside) did not distract from the overall color-blocking. 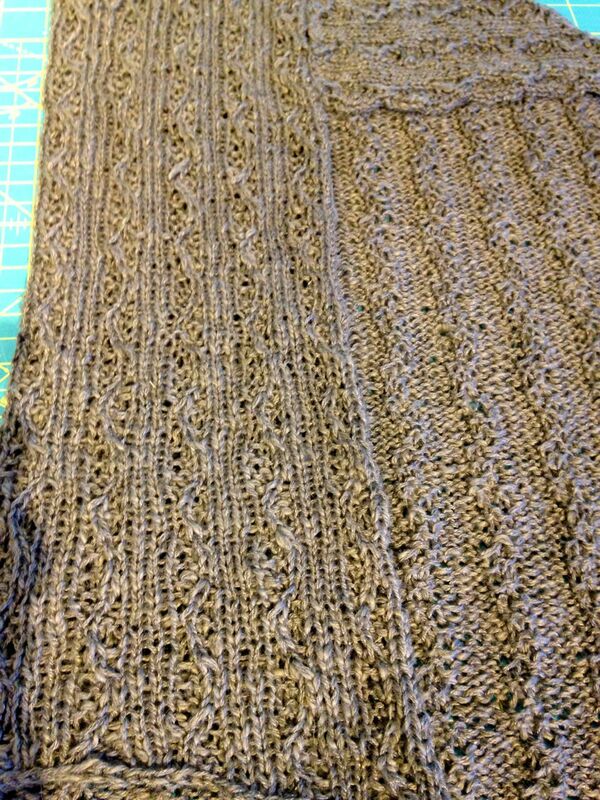 Ordinarily, I center the neck band seam at the back. However, I offset it a little bit to reduce bulk at the back of the neck. This top is built to last and is now a part of her everyday wardrobe. BTW, this is my 30th rendition of Kwik Sew 2555 since I started tracking my pattern use. A second-skin unitard is a nonstarter. A one-piece is just not practical for all-day wear. 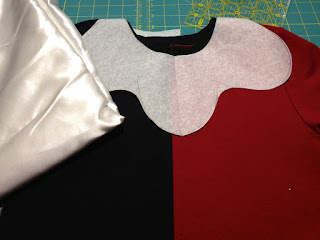 From the beginning, I knew that I would be making a top+leggings. This pair of leggings may not look like much, but it is a milestone. The last pair of leggings I sewed for her, back in January 2015, was made with the child-sized pattern, Kwik Sew 3476. 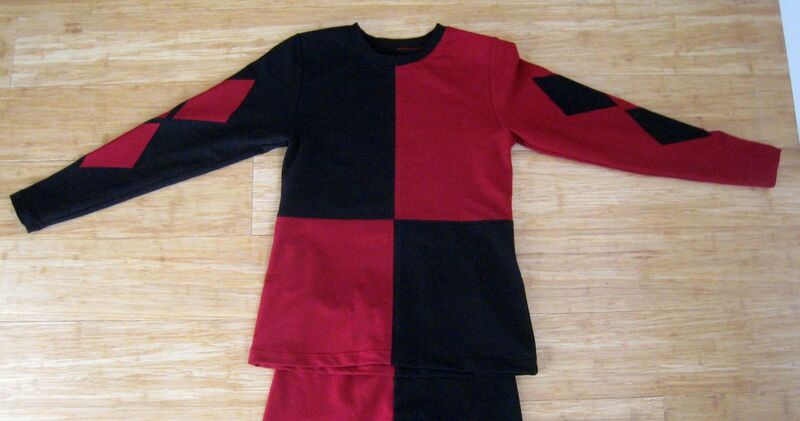 I had to add so much length to the pattern, I decided to trace out the adult-sized Kwik Sew 3636 this time. My baby is growing up. Sniff. 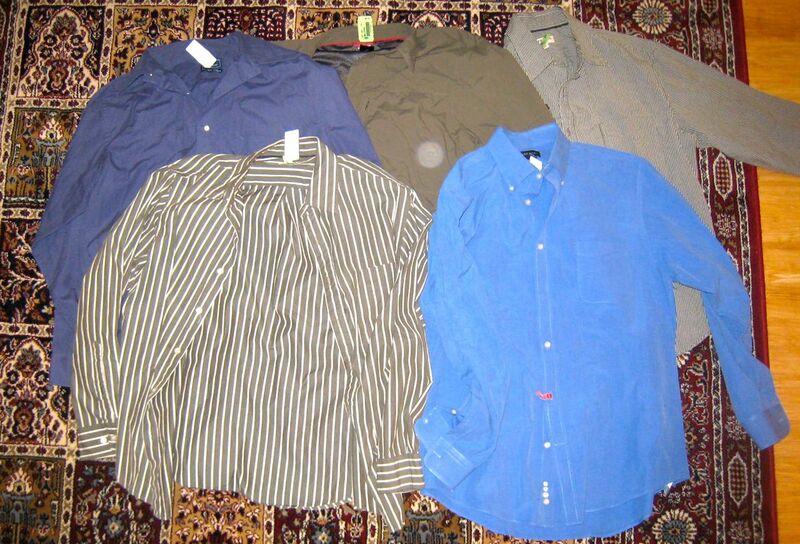 Colorado Fabrics had a nice assortment of cotton/lycra stretch French Terry this summer. I brought some home in red, dusty pink and olive. 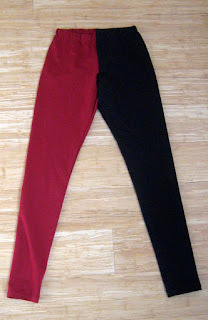 I combined the red with the black cotton/poly/lycra stretch French Terry I bought from CF last winter and used for the non-Hammer pants. The rest of the costume required more thought and planning. Stay tuned. Halloween costumes can be an unseemly waste of resources. Think of all those costumes that get trashed after one wearing. I try to make clothes that have a life after Halloween in a non-costume-y way. These leggings are now pajamas. 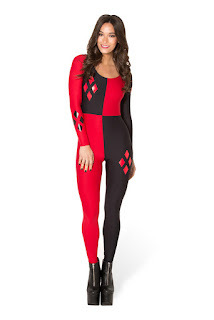 When my daughter told me that she wanted to dress as Harley Quinn for Halloween, she showed me the PG-13 picture below rather than allowing me to do a Google Image search. Smart girl, because I was very, very unhappy with what I saw when I did the image search (after agreeing to the costume). With a few subtle changes, HQ goes from PG-13 to soft-core p@rn. Guess which image is more prevalent on the internet? At least that is better than the version in the computer game, which is plain p@rn. 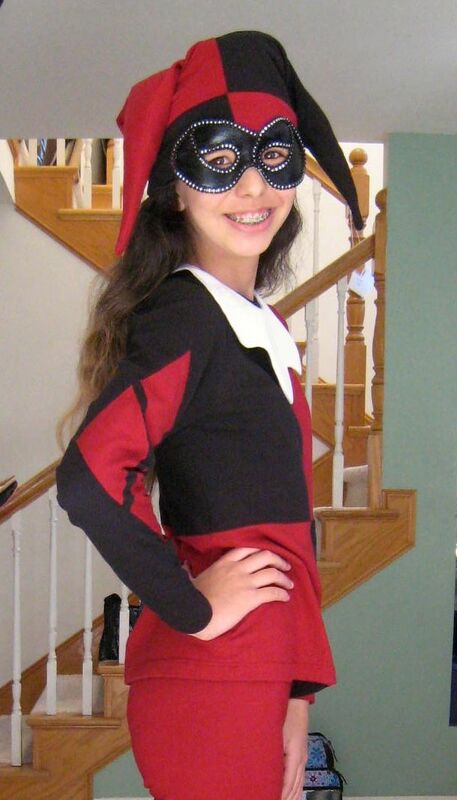 H/T (hat tip) to Sarah, this is for her post about the evolution of Harley Quinn. Why does HQ's outfit get skimpier and skimpier over time while her boyfriend, the Joker's, stays pretty constant? Also, read Boing Boing and the Hawkeye Initiative for more responses on the same theme. This hyper-sexualization of female figures in comic books and computer games alarms and discourages me, on so many levels. How can pointing out the misogyny of these portrayals be portrayed as an attack on men? Portrayals such as these are attacks upon women! Pointing out the hyper-sexualization and victimization of women in computer games is truth-telling. How can the Gamergate crew twist this around so that they are the victims? These pathetic excuses for human beings cry foul: Boo-hoo, women are taking our fun (violent misogyny) away from us. I know, let's threaten and harass them on line and in real life. They even sent a SWAT team to the home of the mother of one critic of on-line culture. That's not harassment, that's terrorism. Read Vox and the Daily Beast's coverage of Gamergate's tactics to shut down a discussion about the problems of gamer culture and how to make online games a safer place for women. I watched in fascination while a friend executed perfect needle-turn applique on a Hawaiian-style quilt without thread-basting. I asked how she could manage to keep her working thread from getting caught up in the pins. 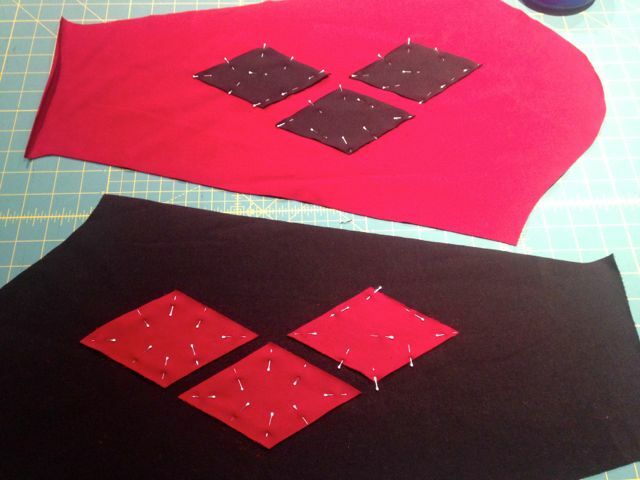 She replied, "I'm using short applique pins." I went out and bought them immediately. They make all the difference, whether you are hand or machine appliqueing (as I did on this project). You want these Clover applique pins. They are expensive, but use those chain store coupons to make them more affordable. The time you save and the improved results you will achieve are worth the expense of buying good tools. 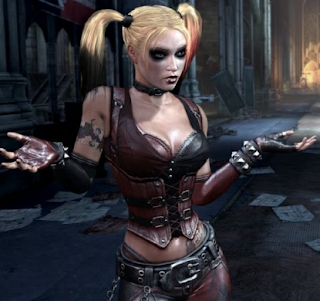 The Harley Quinn inspiration picture that DD showed me. 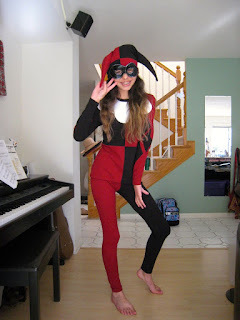 A bit tight for a teen, but looks like a fun costume. The least disgusting costume I could find RTW on the internet. But only available in Australia for > $100 and with a warning that the fabric is sheer and requires a full-body flesh-toned body stocking. Sigh. Why are RTW Halloween costumes for women so slutty? 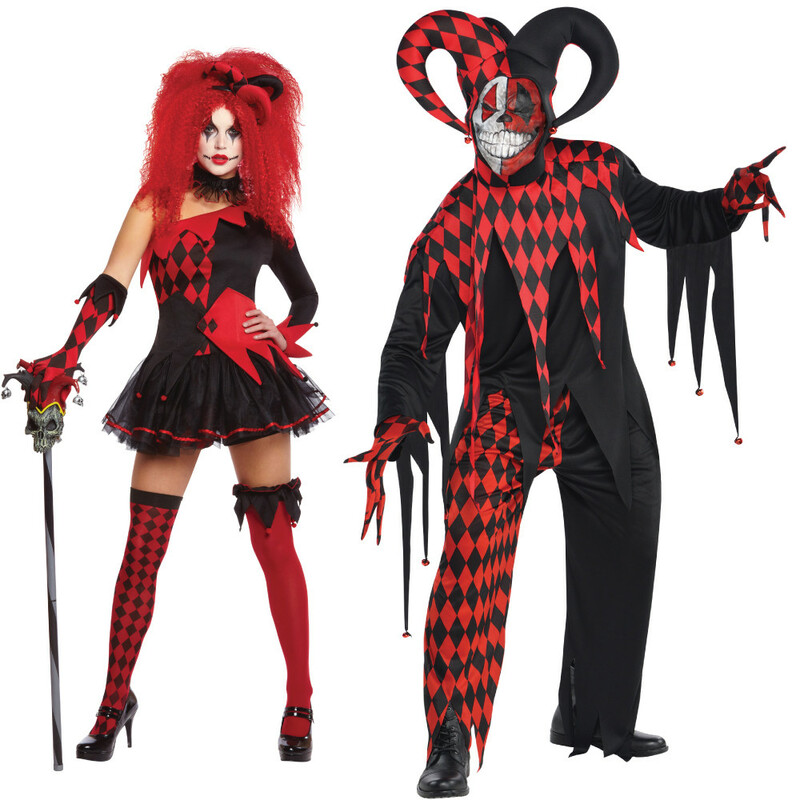 Difference between men's and women's costumes. The costume is done, mailed off to LA, and tried on for size. It fits! More pix and construction deets after she's debuted the costume. I sometimes contribute to the Native Intelligence section of LA Observed. If you need some frightening reading for this weekend, may I recommend Santa Monica tsunami forecast? 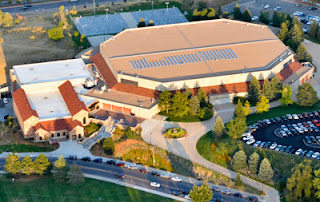 The GOP presidential debate is taking place right now at the 11,000+ seat Coors Events Center on the CU Boulder campus. Only 1,000 of those seats will be filled. Most of the tickets are going to GOP donors or potential donors. The community of Boulder gets road closures of main arterials during peak commute hours in exchange for 0 seats for the event (and a 2-day! closure of a bicycle arterial). The campus hosting the event? At first, they got 50 tickets, then 100, then 150. University officials told the Daily Camera this week that of the 150 CU tickets, 99 tickets are for students, 17 are for faculty and 34 are for event volunteers, the nine members of the Board of Regents, plus a guest each, Chancellor Phil DiStefano and a guest. This event just gives the national press an excuse to run lazy and stupid stories like this. The GOP gets to borrow the veneer of economic vitality of this STEM-heavy community while not mentioning how much of Boulder's high-tech economy is due to the THREE national labs and the only major research university in the Rocky Mountain time zone--all fueled by federal spending they want to cut. Meanwhile, the residents and students are told to stay home and avoid the streets. What's the GOP plan for the small businesses that will be empty tonight? My first time in Boulder, I took a shirt-sewing class. With practice, I got pretty good at it. But, Bad Dad is so hard on his clothes and not discerning enough to warrant my precious sewing time. 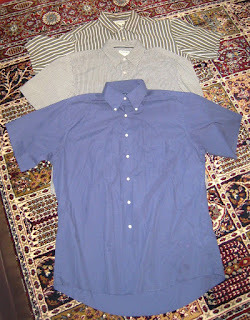 He did ask for short-sleeved shirts that he can wear in lab, that don't require ironing, and look presentable enough to step into a meeting. Measure and mark off your desired length + 1.5". 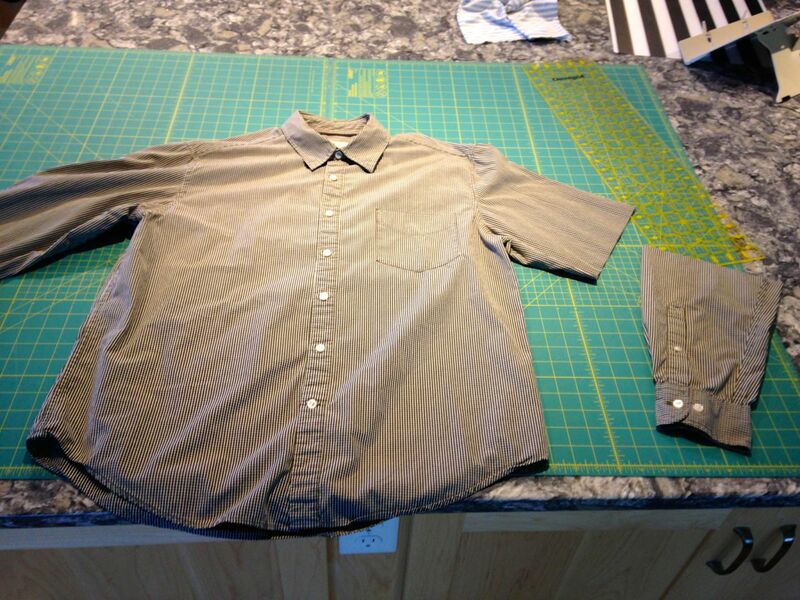 (I cut mine 6.5" from the underarm seam for a ~5" sleeve length.) 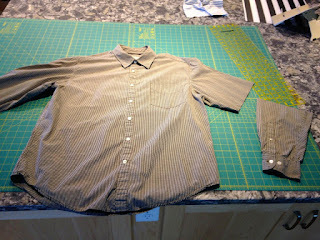 Notice that the sleeves taper toward the cuff. 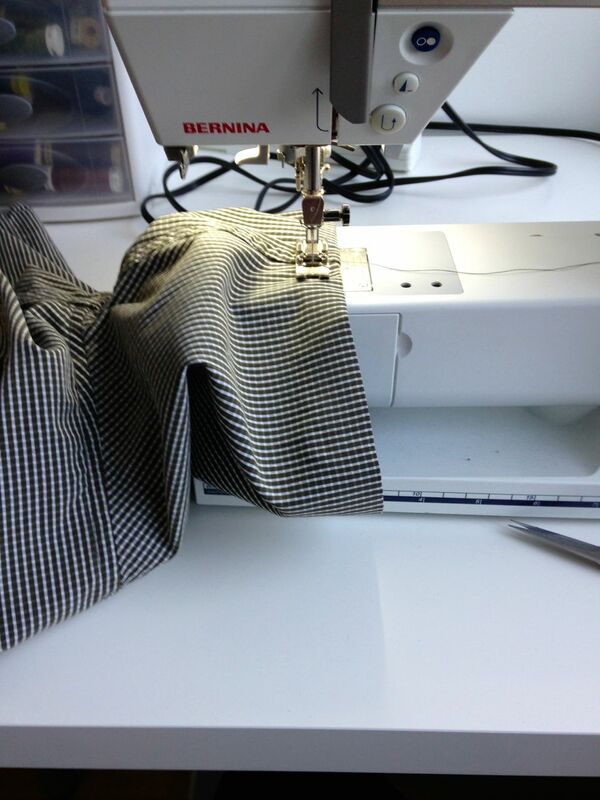 Stitching a smooth hem will not be easy. 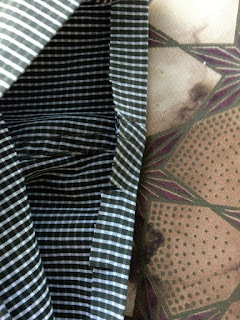 If you turned up a hem the way short-sleeved sport shirts are normally hemmed, by turning under 1/4" and then another 1", you'd have a mess. The sleeve circumference varies about 3/4" between two spots 2" apart along the length. You need to turn under a smaller amount, about 5/8". This way, the difference between the two circumferences is manageably small. Turn under 5/8" once. 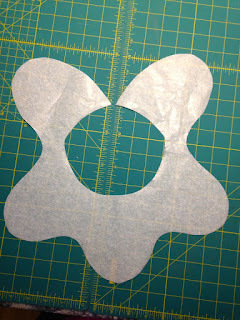 Make 4 snips near the underarm seam that extend just shy of the fold. The snips won't show, but they will allow a little bit of extra girth. Turn under 3/4". 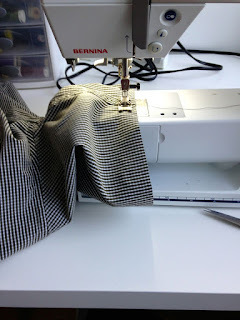 Stretch, steam and press to help the hem lie flat. 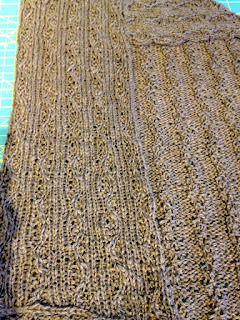 The hem area will still a bit shorter than the sleeve once the fabric relaxes. Use C = 2πr to your advantage. Hem from the outside so that the smaller part is on the inside of the cylinder. Give it a good press again with steam. 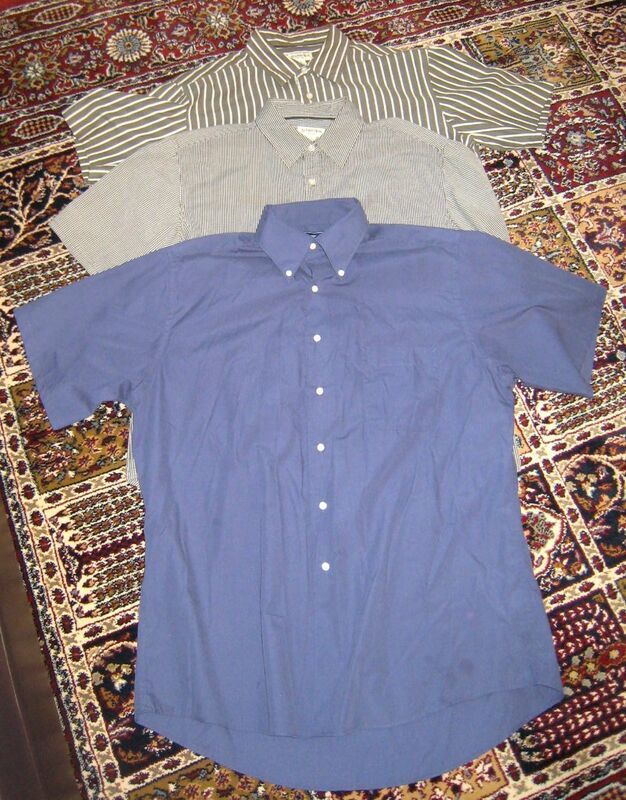 Three short-sleeved shirts for lab. In other news, I finally finished DD's Halloween costume and mailed it off to her priority mail so she can wear it to school on Friday Oct 30. I also altered the green mock-wrap top to reduce the front gape. I just need to make her birthday outfit, stitch curtains for the guest room, finish the last pair of pillows and I can engage in some selfish sewing. It was just one of those weeks. Something that I thought should be straightforward, but tedious, turned out to be really hard. Several times, I couldn't believe what I was seeing. I thought I was going crazy because commands that used to work, generated screenfuls of error messages. It got so bad at one point, I did the UNIX equivalent of "WhereTF am I?" and typed pwd (print working directory) and THAT generated errors. There was nothing left to do but to log out (of that interactive session on the supercomputer) and log back into a different node. I mentioned the odd behavior to a coworker, but neither of us connected that incident to the database migration that took place the day before. I know, those of you more familiar with databases are probably laughing your head off right now. Finally, after 4PM on a Friday afternoon, all but one interactive node and about half the (75,000) nodes lost contact with the disk system. There was nothing I could do by hanging around the lab while the IT team worked to rescue the machine. 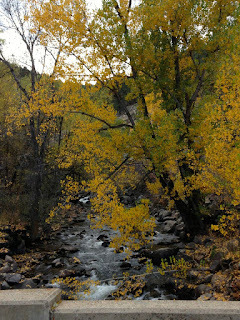 It was time to go out in the field for some riparian ecosystem research. I didn't use my car at all this weekend. 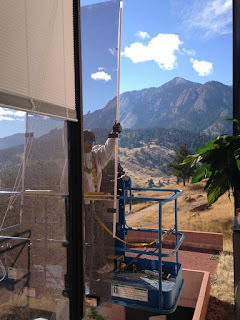 Boulder's bicycle network, and my condo's central location, let me do everything I needed to do by bike. 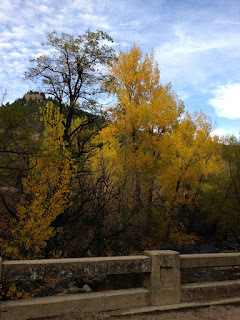 The trees are so glorious this time of year, I took the loooong way whenever I ran errands. OOPS, I checked my receipt and Liberty's website. 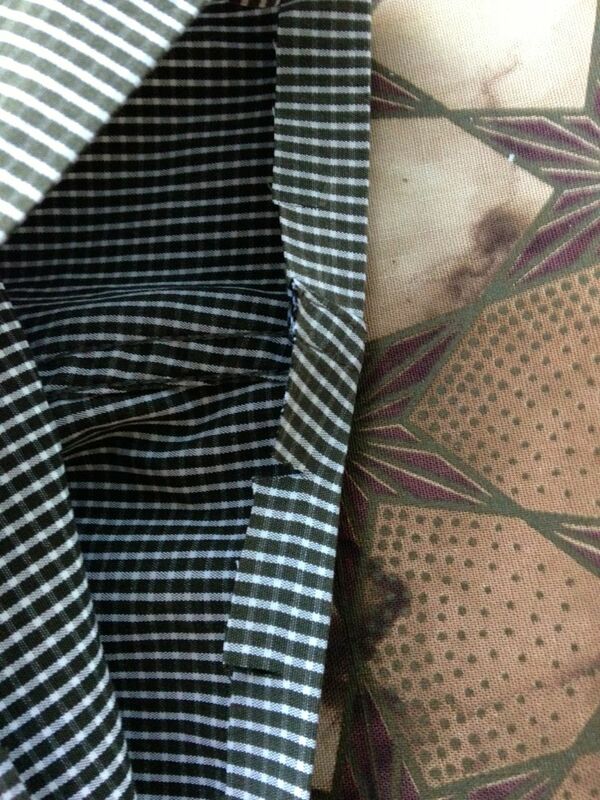 It is a Tana Lawn after all, and I paid $66 for the 1.5 yard piece, not per yard.